Mother Thekla, who died on August 7 aged 93, was the last surviving nun to have occupied the enclosed Orthodox Monastery of the Assumption in North Yorkshire, but became better known to the wider world as the spiritual muse of the composer Sir John Tavener. A beautiful, Russian-born Cambridge graduate who co-founded the monastery near Whitby and latterly lived there in seclusion as the abbess, she furnished the words for some of Tavener’s most important religious works, and was the spiritual driving force behind one of his most popular pieces, The Protecting Veil (1987). The next day’s post brought, from Thekla, the quote from Shakespeare’s Hamlet: “May flights of angels sing thee to thy rest”, together with verses from the Orthodox funeral service . Although it was retitled for the occasion, Song For Athene went on to become the music played when the coffin of Diana, Princess of Wales, was borne out of Westminster Abbey, in August 1997. Mother Thekla was also Tavener’s librettist on his opera Mary Of Egypt (1992) and choral works including The Apocalypse (1993) and Fall And Resurrection (1999), which was dedicated to his friend the Prince of Wales. She exerted a remarkable influence on Tavener, a Presbyterian who had flirted with Roman Catholicism before converting to the Orthodox Church in 1977. He contacted Sister Thekla, as she then was, in 1984 after reading a religious book she had written. She subsequently became one of the composer’s principal spiritual guides: he called her his spiritual mother. Thekla was brought up in England and worked as an actress and schoolmistress before taking her vows. Her relationship with Tavener was almost telepathic: she would send him odd words — “crucify” or “apple”, for example — which he would instinctively understand and interpret. He once described her as “the most remarkable woman I have ever met in my life”. Yet in many ways the pair were complete opposites. It was Thekla, ever practical, who drilled the unworldly Tavener in the dynamics of a creative partnership. She never lost her volatile , thespian streak, and insisted on calling him “darling”. For all her devoutness, Tavener considered her “a pretty wild character, pretty formidable; she has a ferocious temper”. With another nun, Mother Maria, Mother Thekla founded the first Orthodox order in England, moving from a monastery they had founded in 1966 at Filgrave, Buckinghamshire, to a dilapidated farmhouse at Higher Normanby, outside Whitby, in 1971. It was the bleakest spot they could find, on the edge of the North Yorkshire moors. The nuns would meet only at lunchtimes, for a frugal meal of home-grown vegetables and rice. At the hesychasterion (the hermitage or prayer-house) Thekla followed the simple routine of the 7th-century saint Hilda, rising at 4am, swathing herself in a loose black “shroud” that served as a habit and praying every three hours six times a day. The farmhouse was divided into simply furnished “cells” in which the nuns slept and meditated; a former cowshed became their chapel . As well as the fixed routines of their daily offices and obligations, they translated religious liturgies, painted icons to decorate the chapel walls and cultivated the land around the farmhouse. Tourists were not encouraged. A sign at the entrance warned: “Monastery enclosure, do not enter.” Originally there were five nuns at Higher Normanby, but Mothers Maria, Catherine and two others eventually died. Thekla remained there alone until 1994, hoping that a younger, American-born, sister nun, Mother Hilda, would take over. Ultimately, this was not a success. Some years ago Hilda unceremoniously delivered Mother Thekla to the infirmary at the Anglican Abbey of St Hilda in Whitby. Hilda did take over the monastery, but sold it, and died in Whitby in 2010. The daughter of a barrister, Mother Thekla was born Marina Sharf on July 18 1918 at Kilslovodsk in the Caucasus amid the clamour of the Russian Revolution. She described being baptised in a flower vase because her parents were prevented from getting to the church by crossfire in the streets. Shortly afterwards they moved to England and she grew up at Richmond, Surrey, before moving to Chelsea. Educated at City of London Girls’ School, she went up to Girton College, Cambridge, to read English, graduating in 1940. The following year she joined the WAAF and spent the war working for British Intelligence, partly in India, being mentioned in despatches in 1943, although she would never be drawn on this episode in her life. After the war she worked for a few years as a civil servant in the Ministry of Education, and later worked as a teacher, becoming head of English at Bedford Girls’ School. Her new life was totally at odds with her privileged upbringing. As Mother Thekla, she baked loaves of bread, while her eggs were supplied by a local farm. Although the monastery was equipped with a microwave, a washing machine and a computer, such fripperies as television, radio, telephone and newspapers were banned. It was Thekla’s short book The Life Of St Mary Of Egypt (1974), about the famous prostitute-saint, that caught the attention of John Tavener and became the basis of his second opera, Mary Of Egypt (1992). In the meantime she had counselled Tavener following the death of his mother in 1985, after which he feared he would never write music again. Having found his muse once more, Tavener was advised by Thekla to “return to the marketplace” — to write more commercially — and he did so with The Protecting Veil for cello and strings, which, for all its mystical content became a huge popular hit, thanks in no small part to Classic FM, which played it repeatedly. “It became ridiculous,” Tavener recalled. “I couldn’t even go to an airport without being accosted by people saying: 'I want to tell you now much your music means to us’.” The piece was so successful that it allowed Tavener to become self-sufficient as a composer. She wrote the texts for Tavener’s visionary We Shall See Him As He Is (1993), drawing on the First Epistle of John, and for Let Us Begin Again (1995), which is mimed as well as sung. For Total Eclipse (2000), in which Tavener pitted an orchestra of baroque instruments against the soaring soprano saxophone of John Harle, Thekla compiled words from the gospels for soloists and choir which described St Paul’s conversion on the road to Damascus. In 2003 reports of a “frightful bust-up” suggested that Mother Thekla and Tavener had fallen out, apparently over the composer’s growing interest in Eastern religions. Mother Hilda declared that if asked to explain what had happened, Thekla “would probably say, and pardon my French: 'Go to Hell’”. A reconciliation followed. Mother Thekla was the dedicatee of John Tavener’s memoir The Music Of Silence: A Composer’s Testament (1999). 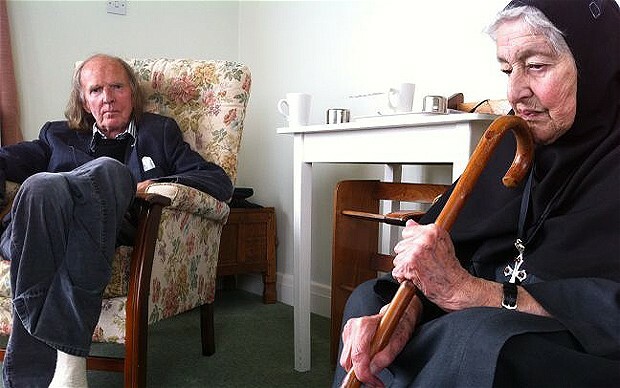 Not only had she helped him spiritually, Tavener said, she had also “helped me put my music and my life together”. Much to her distress, Mother Thekla left no surviving colleague. At her funeral at the Abbey of St Hilda a choir will sing a newly-written piece by Tavener, They are all Gone into the World of Light, as well as Song for Athene.